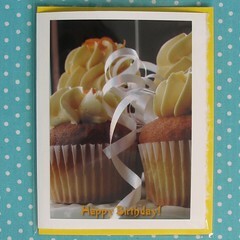 Allison Gryski: Cupcake cards in shop! The cupcake cards are now available. I've listed one pink and one yellow to begin with. I have a few other styles that I'll be adding in the next few days. It was hard to choose. I like them both really. It took me a day or so to realize that we got to play "Vote" again. Also what we were voting in relation to. LOL!